Several months ago I wrote about our ever-ending quest to find larger items to save money on. We finally “bit the bullet” and got rid of our cable. Even after reading about others who had done it, I thought we could never live without it. It was our one splurge – not eating out much, not spending much on clothing, makeup, recreation, etc. As my friend Mara (of Kosher on a Budget) calls it – there are no sacred cows. So we did it – but after some careful research! Here is my original post: Save big on your phone and cable! 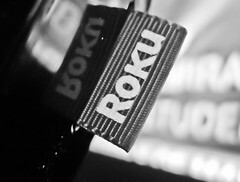 The hookup of our Roku device was very easy – however, we first bought the wrong one. We didn’t realize that our TV would not work with the hookup of the newest Roku model. It said it worked with most HD TVs, so we just assumed it would be fine with ours. Wrong! Be sure to check what kind of hookup your TV requires and be sure that model of Roku has that connection! And be aware that the Roku devices do not always come with the cable you may need. Read reviews for this, too, so you know all the parts you may need to get. So we returned the newer one and got the previous model (which did save us $50, by the way) and thanks to Amazon Prime, it came in just two days. The hookup was then quite fast and we were able to watch in a few minutes. The hard part was figuring out the multitude of channels. I still do not know what they all are for and many have charges that are not specifically stated on those first home screens. We have stuck with using HuluPlus ($7.99/month), Netflix ($7.99/month), and Amazon Prime ($79/year or $39 if you are a student). My boys also like PBS Kids, which is free. So far 2 out of 3 of our worries were unfounded. HuluPlus lets you add shows to your Favorites list and then new episodes appear on your Queue as they are available. You can also manually select any episodes or shows to your Queue. The font size is a bit hard to read on HuluPlus on our smallish TV, but no biggie! The last, that some of our favorite shows would not be available, was true. Neither HuluPlus, Netflix or Amazon Prime seem to have current episodes of Disney, ABC Family, Lifetime, USA or CBS shows – without an added fee. You can often buy one episode of a show for $1.99, but I am not about to pay that for one show! So for now, we are watching older seasons on Netflix when we can find them (Disney, some ABC Family, and CBS are available). And we are waiting and hoping all of the above mentioned stations will work out some deal with these streaming providers soon! The other option is to watch them online, but that is not as convenient for us with my laptop which often overheats. A friend has mentioned hooking up our laptop to the TV screen, but that is for another day! The boys love it and really have so much to watch. They are loving catching up on older episodes of their favorite shows, finding every superhero show imaginable, and the watching the PBS Kids channel, which has a large selection of great shows (Arthur, Magic School Bus, Wild Kratts, Dinosaur Train, Word Girl, and more). Have you made the switch? Share your feedback below in the Comments section! I downgraded my cable two years ago,.so I only get channels 2 through 20. I dont watch a ton of tv anyway. Really only kept cable to keep internet and phone for alarm system..; was too expensive to buy them separately so i felt Like i had to keep cable. Would love some advice Rachael on how I could keep both, but pay less. We did lose a tiny discount on our internet by not having the bundle with phone and cable, but we are saving so much by having those with other companies, that it didn’t matter. We don’t have an alarm system so I do not know about that. I am sure there is some information online about using an internet-based phone service and an alarm system. Let me know what you find. Thanks for reading! I would love to do this and I’m going to show your post to my husband. The cable thing is more his and my sons and it is mine. I really thought we couldn’t do it and would miss it so much, but it has been great! Thanks for reading!